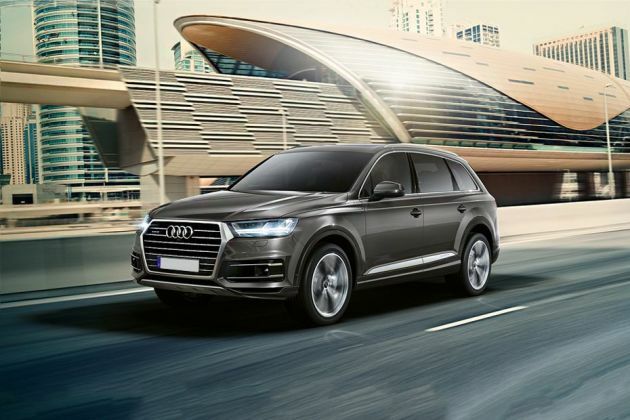 Audi Q7 45 TDI Quattro Technology is the highly priced variant in this model lineup that now, comes with refurbished interiors and exteriors as well. Several modifications are seen in its arresting cabin like a new infotainment system, and the entire dashboard looks quite modernistic. Also, there are leather covered seats with electric adjustment facility, and the four zone climate control system further adds to their convenience. On the outside, it gets a restyled radiator grille, while the headlight cluster carries bright LED lamps. The daytime running lights in double arrow shape further adds to its style. Newly designed alloy wheels are fitted on its sides, whereas its rear end is highlighted by the LED tail lamps. Besides these, the other main change is made to its dimensions. Compared to its outgoing model, this latest version now weighs nearly 325 Kgs lesser, and 37mm shorter. Meanwhile, the width is 15mm less and has a 12mm shorter wheelbase. Its light weight construction even aids in giving better mileage and improves pickup. Mechanically, it has a 3.0-litre diesel motor, which is paired to an 8-speed automatic transmission gear box. The front fascia looks quite good with a large hexagonal shaped radiator grille that is garnished with chrome. This carries the Audi's four rings, which are neatly embossed. On the either sides, it has luminous LED headlamps integrated along with turn indicators. Also, there are stylish daytime running lights that further gives it a stunning appeal. The bold bumper includes wide air ducts and a couple of fog lamps. The noticeable elements on its sides are the outside rear view mirrors with side turn blinkers, chrome window sill, aluminum roof rails and flared up wheel arches. The newly designed 18 inch forged aluminum wheels come covered with 255/60 R18 sized tubeless tyres. In its rear end, the tail light cluster is equipped with LED lamps, and a wiper is fitted to its windscreen. Also, it includes a sporty spoiler, dual exhaust pipes, stylish boot lid and a body colored bumper, which makes its look complete. The luxurious internal section comes packed with some of the highly advanced equipment and includes facilities, which offer maximum comfort. The cockpit has a contemporary theme, while the dashboard includes aspects like a multifunctional steering wheel, instrument cluster, and air vents as well. All its seats are covered with Cricket leather upholstery. The front seats have electric adjustment facilities, while the rear ones can be folded to make more space for luggage. There are storage compartments available inside including bottle holders on door trims, two cup holders on the center console, storage nets at the back of front seats, rear seat box and a few others. Aside from these, it also has premium textile floor mats, auto dimming inside rear view mirror, electric luggage compartment cover, lighting package and many other such aspects. This SUV is powered by a 3.0-litre, V6 diesel engine that has a common rail fuel injection system. It is a six cylinder oil burner, which has 24 valves. With a displacement capacity of 2967cc, it generates 245.4bhp between 2910 and 4500rpm, whereas the torque output of 600Nm that ranges between 1500 to 3000rpm. This mill is coupled with an 8-speed tiptronic automatic transmission gear box that distributes power to all its wheels. It returns a maximum mileage of about 14.75 Kmpl, meanwhile, it achieves a top speed of 234 Kmph. On the other hand, it takes around 7.1 seconds to break the speed limit of 100 Kmph from a standstill. All its four wheels are fitted with ventilated disc brakes, which ensures short stopping distances. It is accompanied by anti lock braking system along with electronic brake force distribution. The manufacturer has offered it with an adaptive air suspension system with variable adaptive damping system. On the other hand, it has an electric steering wheel with tilt adjustment facility. This helps in easy handling of the vehicle in any road condition. High level of comfort is guaranteed in this trim, which is loaded with numerous interesting attributes. A four zone automatic air conditioning unit ensures a pleasant environment inside. It has the advanced Drive Select function, which is useful for adjusting driving characteristics. The MMI radio plus comes with a 7-inch high resolution color display screen. It has Bluetooth interface that enables audio streaming, while the Audi sound system with a 6-channel amplifier guarantees excellent listening experience. Other than these, the list also has cruise control, electrically operated panoramic glass sunroof, Audi phone box, rear center armrest, sunblinds, and many more. The car maker has offered this variant with a number of security attributes. Some of these include seat belts with pretensioners and force limiters, head airbag system, first aid kit, tyre pressure monitoring display, power door locks, reversing camera and anti theft alarm system. Besides these, it also has crash sensors, ABS, electronic stability program, ISOFIX child seat mounting, and various other such aspects. 1. Impressive interior and exterior design. 2. Acceleration and pickup is excellent. 2. Rear cabin space can be made better.